The Lewis & Clark Campsite can be viewed from the Old Railroad Bridge Walking Trail from the East side of the Niobrara River or from the lookout at the Niobrara State Park. The campsite is marked by the "Fifteen-Star, Fifteen-Stripe Flag" and a model camp. The Louisiana Purchase is one of the most significant events in all of American history. It almost doubled the size of the United States, and it forever removed foreign influence over the great Mississippi Valley which has become the heart of America. At President Jefferson's request, Congress voted to finance the exploration of the Louisiana Purchase and the land beyond the mountains, the Oregon Territory. Captains Meriwether Lewis and William Clark were sent with instructions to go up the Missouri River to its head-waters, cross the mountains, and follow the most practical river route to the Pacific Ocean. They were to make geographic and scientific observations and to cultivate friendship and trade with the Indian Tribes. Lewis and Clark left St. Louis for their longjourney into the wilderness on May 14, 1804. They were accompanied by forty -five men in three boats - a 55 foot keel- boat and two pirogues (canoes), and two horses for their hunters to ride. Scientific instruments and trade for the Indians were also packed for the trip. The Lewis and Clark party traveled about twenty miles a day, sometimes by sail, others by oar, or during a great part of the time, they pulled the boats with long ropes which the men held while they walked along shore. On September 4, Lewis and Clark camped just above the mouth of the Niobrara River. A map of Lewis and Clark's track through this area. 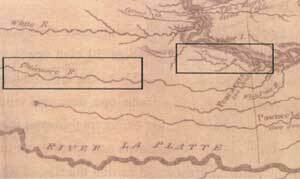 Notice that Captain Clark labeled the Niobrara River as the Quicurre River & the Ponca as the Poncarar. The Ponca then ran east alongside the Missouri River and the mouths of the Ponca& Niobrara were much closer than they are today. "We set out early, with a very cold wind from the S.S.E....and at three miles [reached] a creek called White-paint creek [now called Brazile], about 30 yards wide; on the same side, and at 4 1/2 miles' distance from White - Paint creek, is the [Niobrara, or] Rapid river, or as it is called by the French, la Rivere qui Court [L'Eau qui Court]. This river empties into the Missouri in a course S.W. by W. and is 152 yards wide and our feet deep at the confluence. It ... passes through a hilly country, with a poor soil. Captain Clark ascended three miles to a beautiful plain...; he found the river widened above its mouth and much divided by sands and islands, which joined to great rapidity of the current, makes navigation very difficult... ...(I)t throws out into the Missouri great quantities of sand, coarser even that of the Platte." Here they met the Ponca Indians, who had long made their home in this part of Nebraska. Visiting the Poncas, they found the village of about 50 men nearly deserted as it was hunting season. The nation had once numbered about 200 but wars and small pox had dwindled the tribe. A little beyond, they saw great herds of buffalo. antelope, deer and villages of prairie dogs. This Flag became the Official United States Flag on May 1st, 1795. Two stars were added for the admission of Vermont and Kentucky and was to last for 23 years. the five Presidents who served under this flag were George Washington, John Adams, Thomas Jefferson, James Madison, and James Monroe. The 15-star, 15-stripe flag was the only U.S. Flag to have more than 13 stripes. Captains Meriwether Lewis and William Clark carried this flag on their journey from St. Louis to the Pacific Ocean. It was this flag that was immortalized by Francis Scott Key during the bombardment of Fort McHenry, September 13, 1814. The image above is representative of that flag. Notice the "tilt" in some of the stars just as in the original "Star Spangled Banner."